The main difference between simple leaf and compound leaf is that the simple leaf has an undivided leaf blade while the leaf blade of a compound leaf is divided into several leaflets. Furthermore, a simple leaf always contains a lateral bud at the base while a compound leaf has no lateral buds at the base of the leaflet. Simple leaf and compound leaf are two types of leaves that occur in dicots. The three components of a leaf are the leaf blade or lamina, petiole, and stipule. The leaf blade is the broad portion of the leaf attached to the petiole, which attaches the leaf to the stem. The small bud-like structures at the base of the leaf are the stipules. A simple leaf is a single unit with a broad, undivided leaf blade, which is attached to the stem through the petiole. 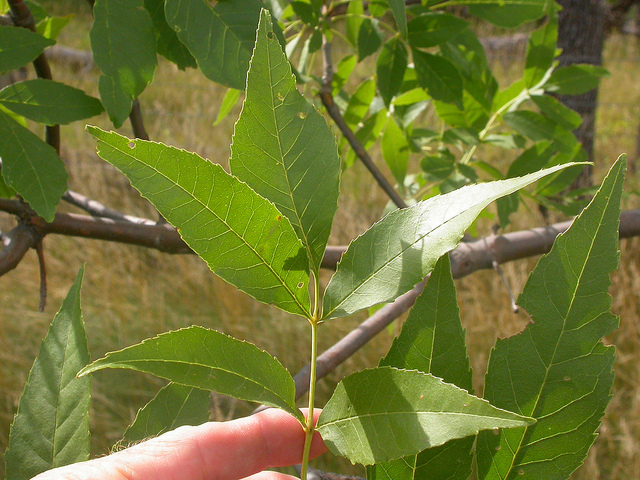 However, the margin of the leaf can be either smooth, lobed, jagged or parted. But, the gap between the lobes will never be continuous to the midrib of the leaf. Each leaf contains a lateral bud at its base. 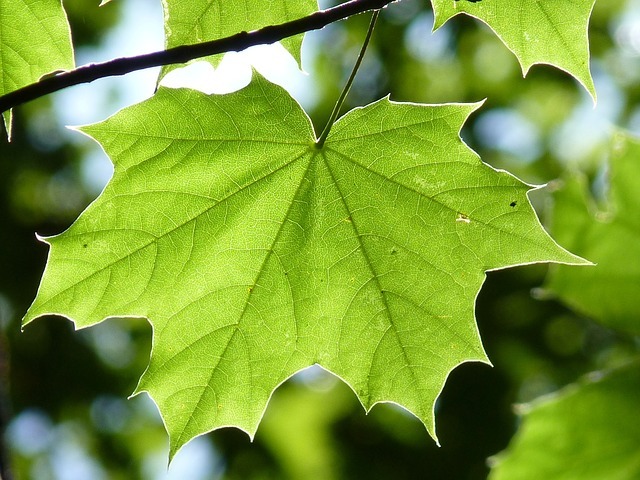 Some examples of simple leaves are maple, sweet gum, sycamore, elm, oak, cherry, and, birch. Most North American leaves are simple. A compound leaf is a collection of leaflets, which are the complete divisions of a single leaf blade. All leaflets are attached to the midrib separately through their own short stems called rachis. But, no lateral buds occur at the base of any of these stems. This means, the lateral bud only occurs at the base of the compound leaf where the petiole attaches to the stem. This is the main difference between simple leaf and compound leaf. The two main types of compound leaves are pinnately compound leaf and palmately compound leaf. In a pinnately compound leaf, leaflets arise from both sides of the midrib. The three types of pinnate arrangements are the unipinnate, bipinnate, and tripinnate. The unipinnate arrangement is the regular arrangement of leaflets along the midrib. The bipinnate arrangement is the presence of secondary rachis apart from the regular rachis. 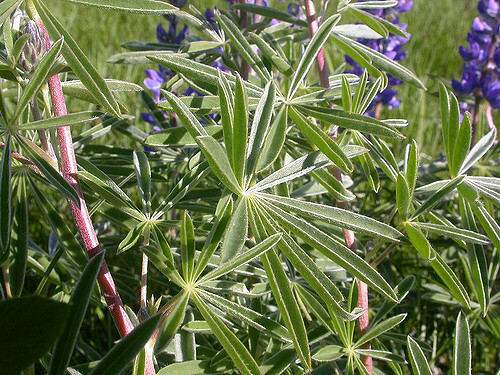 The tripinnate arrangement is the replacement of the primary rachis in the bipinnate arrangement with bipinnate leaflets. In the palmately compound leaf, all the leaflets arise from a single point like a palm. This arrangement is also divided into several types including unifoliate, bifoliate, trifoliate, and quadrifoliate. Simple leaf and compound leaf are the two types of leaves that occur in dicots. The leaf is the main photosynthetic structure of plants. It contains a broad lamina. Also, the leaves show adaptations to the habitat where the plants live. The three components of both types of leaves are the lamina, petiole, and stipule. A simple leaf refers to a leaf with an undivided leaf blade while a compound leaf refers to a leaf which contains a series of leaflets attached to the midrib. 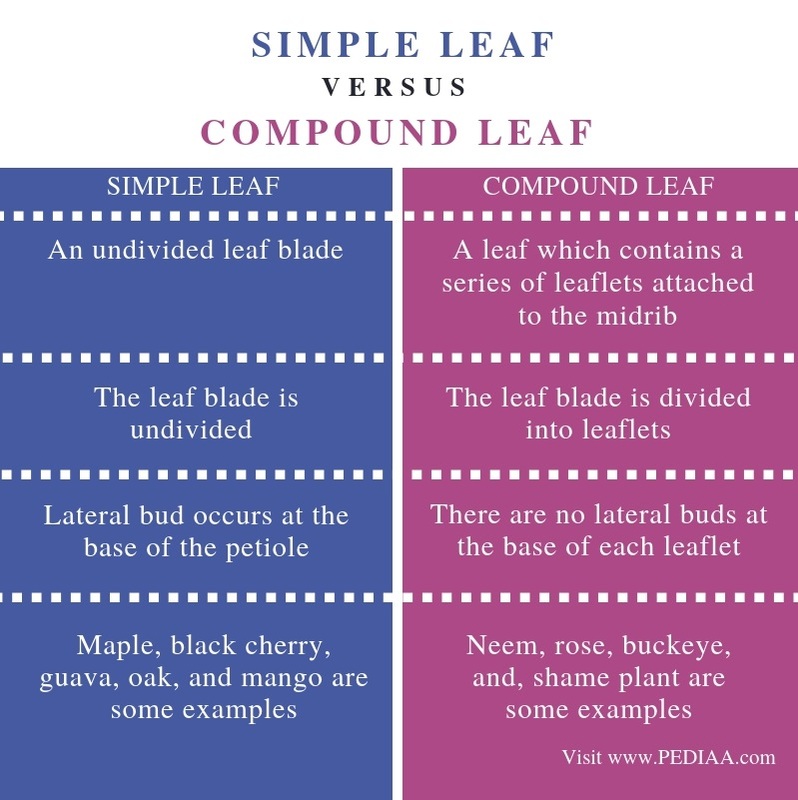 This explains the basic difference between simple leaf and compound leaf. The leaf blade of a simple leaf is undivided while the leaf blade of a compound leaf is divided into leaflets. This is a main difference between simple leaf and compound leaf. Another difference between simple leaf and compound leaf is that the lateral bud of the simple leaf occurs at the base of the petiole while there are no lateral buds at the base of each leaflet. Some examples of a simple leaf are maple, black cherry, guava, oak, mango, etc. while some of the examples of a compound leaf are neem, rose, buckeye, shame plant, etc. A simple leaf has a broad, undivided leaf blade while the leaf blade is divided into several leaflets in a compound leaf. The lateral bud only occurs at the base of the petiole in both leaves but, not at the base of the leaflets. 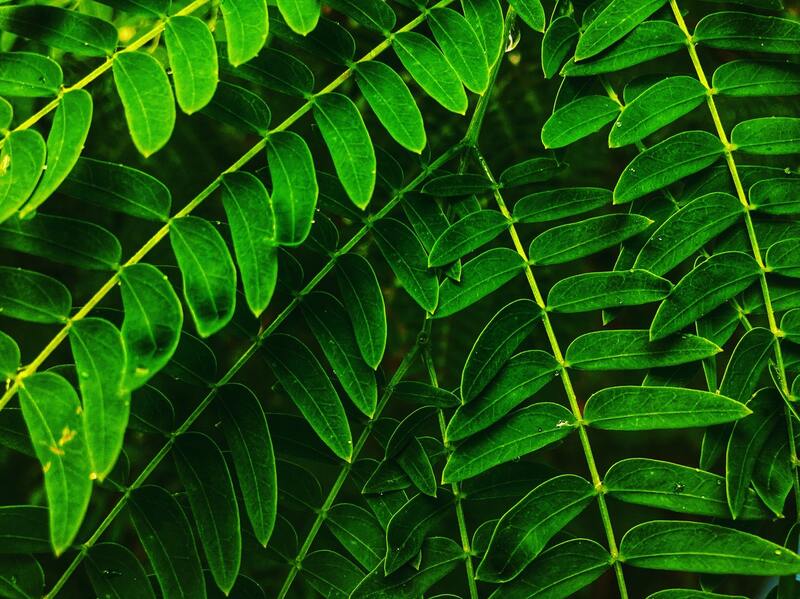 The main difference between a simple leaf and compound leaf is the division of lamina.